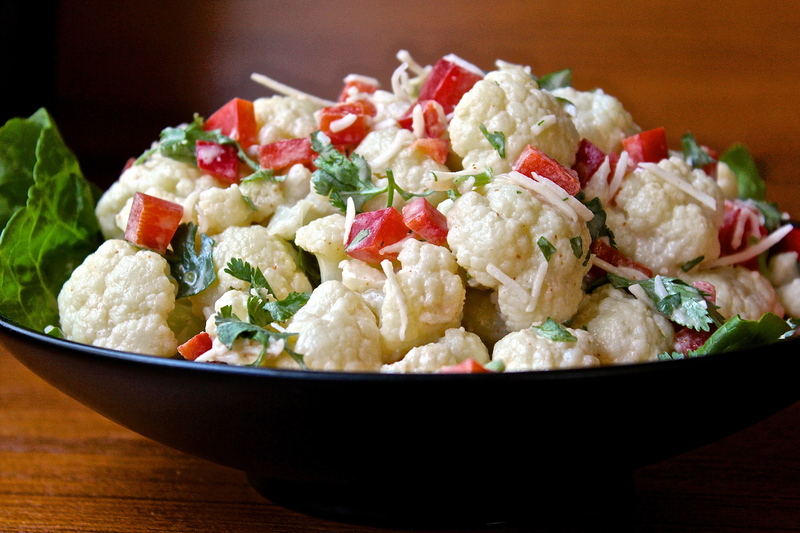 Java-Style Cauliflower Salad | What about this? Like an artist’s blank canvas, cauliflower’s subtle flavor provides the perfect background to let dynamic flavors shine. Cauliflower is rich in nutrients, low in calories, and high in fiber, so by adding the bright and zesty flavors of coconut, lime, cilantro, and cayenne pepper, you’ve got a winning combination. In addition, this cauliflower salad can be served hot or at room temperature which makes it a great make-ahead dish. 1. Drop cauliflower florets into a large pot of well-salted boiling water. Boil just a few minutes, until barely tender. Drain and dry on a kitchen towel. 2. Dice the red pepper and set aside. 3. Wash and chop the cilantro and set aside. 4. Chop garlic and put in blender. 5. Add lime juice, brown sugar, cayenne pepper, salt and coconut cream to blender. Pulse until well-blended. 6. Pour dressing over the hot cauliflower. Toss well and transfer to a serving bowl, scattering the red pepper, cilantro, and coconut on top. 1. Make sure the cauliflower florets are well-drained and reasonably dry before adding the dressing. If they still contain a lot of moisture, the dressing will become diluted and runny. 2. I had to rework the dressing recipe. The original recipe called for 1 cup of freshly-grated coconut and 4 tsp lime juice. There was just not enough liquid to make a dressing. I added some coconut cream I had in my pantry to make the dressing “flow.” The grated coconut became a topping, rather than part of the dressing. 3. Because of time constraints, I substituted shredded coconut in a bag instead of grating fresh coconut. Also, toasting the coconut first can bring out its flavor and give it more “crunch.” I will do this the next time I make this salad. 4. Adjust the seasonings to taste – more or less lime juice, sugar, cayenne pepper, and salt. 6. The addition of coconut cream does not significantly raise the amount of carbohydrates in the recipe. The coconut cream has only 3 grams of carbohydrate per 1/3 cup.